Here we are in the first week of November, with several days of 60s and 70s ahead, and my poor Minnesota garden does not know what to do. We’ve only had a couple of freezes so far, and several plants just keep on blooming. 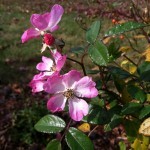 What’s blooming in November? These guys. 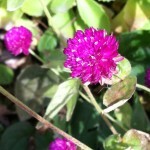 Gomphrena is another persistent annual. This rose bred by Minnesotan David Zlesak is called Oso Happy Smoothie, but I think they should call it “relentless.” It blooms late every year. 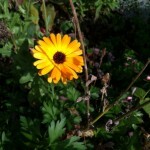 Calendula is another self-seeding annual that I keep around for their long bloom. 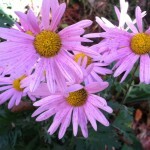 Clara Curtis daisies are a prolific self-seeder, but I enjoy the bloom late in the season. 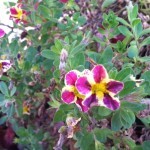 Be sure to cut back early in the year to keep them from blooming too early. Pineapple sage is a very late annual in Minnesota. 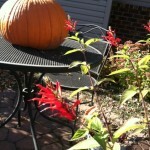 Too bad the hummingbirds are gone, because they love this plant. I almost did not include this calibarchoa image, because it’s a little faded, But you’ve got to admire them continuing to bloom. I’ve got a couple of different Oso Easy roses in my front borders– good blooming throughout the year, and they weather the MN winters just fine. Interestingly enough, they thrived in my Texas garden as well! I live in Denver – we too have 60’s and 70’s and only a couple of freezes – and very mild ones at that – we have lots of roses, mums, petunias, geraniums and marigolds, among others, still in bloom – it’s so nice to still see color! We are enjoying the warmth. It won’t last! This weather is so unusual, isn’t it? I still haven’t had a hard freeze, although most of the perennials have gone dormant for the season. It’s so freaky to have Zinnias and Marigolds still blooming in November! I don’t remember that happening before. The ‘Clara Curtis’ Daisies are lovely. The weather treated your garden pretty well! I can hardly remember November – we had our new garden and our new house in town and I haven’t been recording as much as usual. But I will be back at the camera and computer from now on. Hope you are enjoying the holidays. Thanks for commenting, Pat. We will be in your shoes next fall — planning a move is hectic but a new garden is exciting.